Click the button below to order your “NO URANIUM MINING” bumper sticker now! Powertech Uranium, a Canadian company, now known as Azarga Uranium as a result of a reverse take over and name change, whose major shareholder and a continued source of funding is a Chinese investment fund who itself is under investigation by the Chinese authorities, seeks three state permits and federal licensing to build the first ever ISL uranium mine and processing plant in South Dakota. They propose taking vast amounts of water out of the ground, mixing it with chemicals, injecting it back into the ground to dissolve and extract the uranium, then concentrating the radioactive material (yellow cake) on-site for shipping by truck. If Azarga bought the water from Rapid City, it would have to pay $1 million dollars a year for the amount it seeks, but the company expects to get it for free. water in and above our sources of drinking water. Among other hazards, radon emissions, toxic heavy metals and other pollutants, including chloride, sulfate, sodium, radium, arsenic and iron, are in ISL wastewater ponds. Accidents and leaks in this kind of operation are inevitable, raising concerns about runoff into the Cheyenne River and Angostura Reservoir. It is a big deal! We’re not just talking about some inert solution. The most serious radiation release in the US came from a tailings pond spill at a uranium mine in New Mexico. Economics: Too much is at stake. Protect what we have. Uranium mining is a boom and bust business, prioritizing short‐term extraction and exploitation for foreign gain over the sustainable income source oﬀered to local people by tourism and agriculture. Clean, potable water is critical for agriculture in this semi-arid state in the midst of serious drought. It’s obvious that our water needs to be protected and conserved. ISL uranium mining will result in contamination of ground and surface water with radioactive materials and heavy metals harmful to humans, wildlife and livestock. These three counties will be the most immediately affected. The water and land have never been restored. There are more than 100 archaeological sites that date from pre-history on the 10,000-acre proposed permit area. The uranium-bearing rock formation circles the outer edge of the Black Hills. Exploration has been done from Sturgis to Buffalo Gap and from Hulett south and east to Hot Springs. 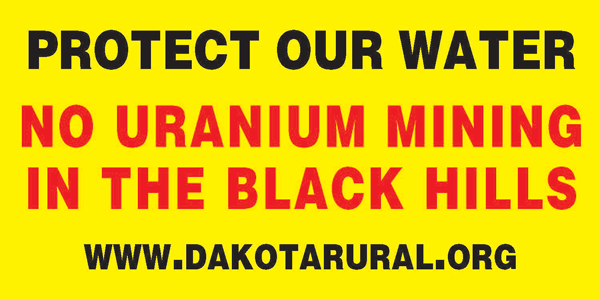 If Azarga’s proposed project goes through, the entire Black Hills is an open door to uranium mining. 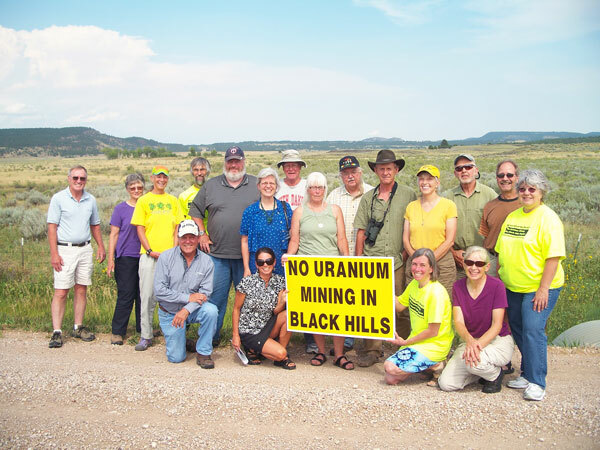 Contact your elected officials and ask them to oppose uranium mining. Spread the word. Write a letter to the editor; tell your friends and family. Powertech wants us to be quiet about this. The more awareness you can raise, the better!